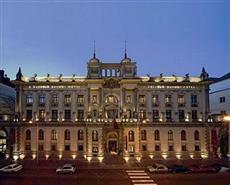 The Hotel Carlo IV, Prague was opened in 2003 after restoration/expansion of an 1890 Neo-Renaissance building that first served as a bank and then a post office. The hotel contains a lobby, which was part of the original building and includes a three-toned marble floor, crystal light fixtures, jewel-tone silk seating, palm trees and a two-story ceiling with elaborate gilded mouldings. The hotel's wellness centre contains an indoor swimming pool with two waterfall torrents for massaging back and neck. Centre can also offer sauna and small fitness room containing a Universal gym, cardio machines, and free weights. Dear Guests, please be advised the spa will not be available to public between 6th September 2010 to 13th September 2010 inclusive. This is due to a regular cleaning and maintenance procedures. We apologise for the inconvenience caused.